I went through life larger than my friends. At age 8, I was known as the bigger girl down the street. I had four children and with each one, my weight continued to climb. Over the years, I tried all the diets. I would lose a few pounds and then put those and a few more back on. I went to a doctor for diet shots and almost died. 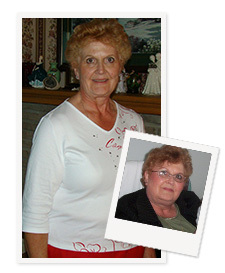 I developed spinal stenosis and had two back surgeries. I had asthma, sleep apnea, osteoarthritis, type 2 diabetes, high blood pressure, hypothyroidism and fibromyalgia. I could hardly walk and had to have both of my knees replaced. Exercise hurt--it hurt to walk at all. With all of my medical problems and a weight of 291 pounds, I knew that I had to do something fast. My youngest daughter was waiting to have gastric bypass surgery in Toronto. She was in her third year of waiting. I searched the internet and found Barix Clinics. I called and set up a consultation. My husband went with me to the consultation. We were sold. I took the paperwork to my primary care physician and he submitted the paperwork right away. I was approved in 3 weeks. It all happened very fast. Everywhere I go, people are congratulating me on my weight loss success telling me how terrific I look. I am having a really good time buying nice clothing that I had previously only dreamed of. But even more important, my diabetes is cured, my blood pressure is perfect, I no longer have sleep apnea, and I don't use my cane or walker anymore--I push my granddaughter's stroller and really move it! My family doctor is so proud of how far I have come and is thrilled with my monthly check-ups. Last month, he said, "You are just a shadow of your former self." That felt so good. I can do so much more now. I have just taken on babysitting my 2 1/2 year old granddaughter and I have the energy to play outside with her. We go for a big walk everyday and I am outside gardening while she plays on the swings. My life is 100% better than it has been for a very long time. The care at the hospital was absolutely wonderful. My every need was met and the nurses looked after me as if I was part of their family. Actually, that is exactly how I felt during my time there--as if we were one big family. The follow-up continues as I receive the newsletter each month and phone calls from the dietitians. Just being able to call anytime that I have questions has made it so much easier for me.